Salopian bowl - 9¼" (234 mm) diameter, 2½" (63 mm) high. The Salopian Decorative Art Pottery Co came out of the Benthall Pottery Co that had been in existence in Benthall, Shropshire since 1772. In 1882, the manager of some twelve year's standing, William Allen, thought that a range of art pottery would be a good idea, to sell alongside the company's traditional line of utility wares, and chose the name Salopian Art Pottery to distinguish the new range. The company produced items of very high quality. 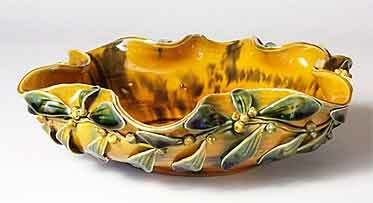 Designs tended to be classical, in earthenware with lead or tin glazes. J A Hartshorne decorated an important range in sgraffito on a plain slip in blue or brown. Art pottery was produced, on and off, until the 1920s when the company returned solely to the production of utility wares - electrical fittings, etc. It carried on until 1982, producing drain pipes.